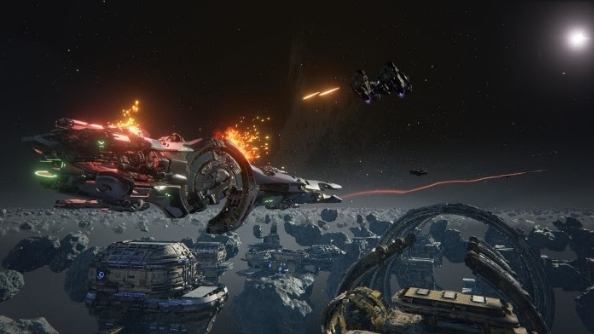 Futuristic 5v5 kinda-MOBA-kinda-not game Dreadnought goes into closed beta this week, with the spaceship blast-em-up being available to players on April 29. Prefer your 5v5 games played on the ground with zany characters? Try one of the best MOBAs. Akin to Fractured Space, players of Dreadnought command massive ships kitted out with a variety of gadgets and weapons. By taking on various battlefield roles, pilots will then cruise their frigates and freighters into battle with the enemy team. Front line assault, scouting, and long-range damage are some of the combat roles you could fill. You can find your way into the closed beta by purchasing a Hunter Pack (£6.99 / $9.99), which alongside guaranteed access comes with a unique medium Hero Ship: the Morningstar, as well as 500 GP to be used in the store to buy cosmetic upgrades. The pack also grants seven days of Elite status for the game’s official launch, which provides more XP and Fleet Points in every match. Hunter Pack owners can also recruit two friends to the closed beta. The Mercenary Pack is a similar deal, but at £27.99/$39.99 comes with far more. The bundle provides five Hero Ships – the Morningstar, the Outis medium corvette, the Silesia light artillery cruiser, the Huscarl heavy destroyer, and the Kali heavy tactical cruiser. Then there’s the 3,000 GP and 30 days of Elite status when the game officially launches, as well as four recruitment packs. Does Dreadnought look like your idea of a good time? If so, head to the beta signup page to put your name down for the closed beta, or buy a founders pack for guaranteed access.